Whats New? 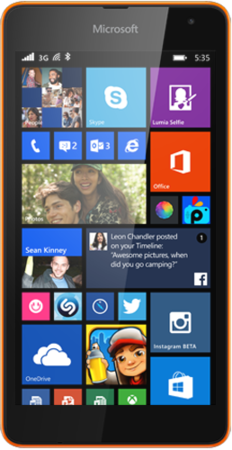 Microsoft Lumia 535 - Big on Experience. Microsoft's foremost Smartphone will surely impress you if you're looking for your next mid-range gadget. Lumia 535 is a less expensive Smartphone and isn't all that dissimilar from the Nokia gadgets that have arrive previous to Microsoft latest shiny innovation Lumia 535. The handset sure is the first smartphone to drop the Nokia branding in errand of Microsoft text at the rear and front, and a company logo on the colorful detachable casing. All future Lumia devices will commence with new branding like 535, and presented Lumias with the Nokia moniker will prolong to be known as Nokia handsets. Specifications might be squat like Lumia 530, but company has made some amends that don't cooperate the practice as much as some other budget Lumia devices. Having a 5.0 inch display 535 support qHD screen with 960 x 540 pixels, a 1.2GHz quad-core processor, and 1GB of RAM. While the 535 screen is something you'd usually see back in 2011 in Nokia phones of Pakistani market, viewing angles of 535 aren't as bad as you'd anticipate even if the pixels are evidently noticeable. The adding together of 1GB of RAM in Lumia 525 as an alternative of the usual 512MB is an imperative move, in particular as we have seen in Lumia 635, a lot of Windows Phone games require higher amounts of RAM. Microsoft has also incorporated auto brightness. A 5-megapixel forward-facing camera with a wide angle lens is also present. Microsoft's Lumia handsets along with the very much talked about new smartphone the 535 are Fundamentally, always integrated with five of company's own services: Skype, OneNote, OneDrive, Cortana, and Office. While 535 can and should be packing these essential apps, it’s hard to see these — with the exemption of Cortana — as differentiators, Office, OneDrive, Microsoft company's Skype and OneNote apps are all enhanced on 730 OS evaluated to their Android Phone correspondents.